As always, right click to open map in full size in a new tab. A relatively simple, if time-consuming, map I did using the "County-BAM" map from alternatehistory.com. 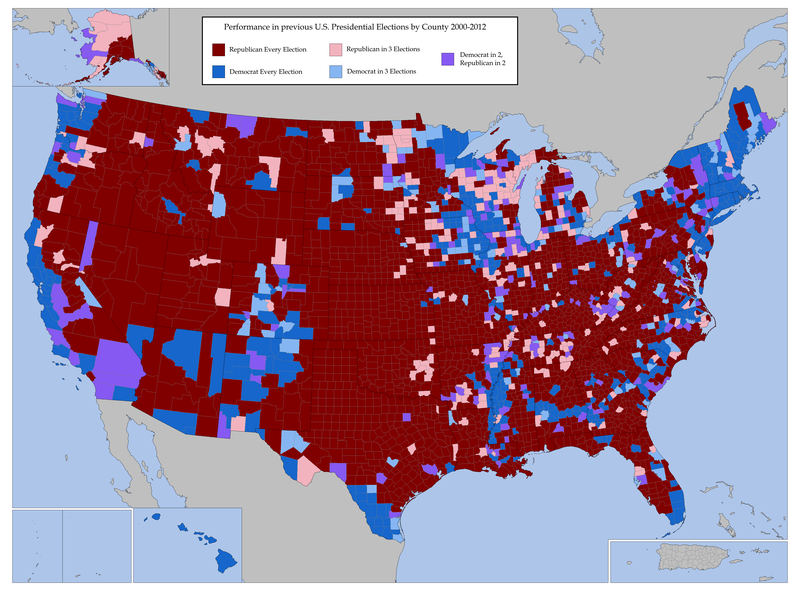 The premise is pretty simple and explained by the key; basically show where Democrats and Republicans have won in the last 4 U.S. Presidential elections by county. Hopefully will be interesting and give an idea where each party is stronger, particularly for this upcoming election. Several of the swing states, including Ohio and Florida, don't swing that much county-wise. As far as, for the most part, all counties vote the same each time by majority. Compare that to fairly solid blue states like Michigan and Wisconsin where whoever wins by county can be a complete toss-up, even if the states tend to go one way. President Obama made a HUGE impact county-wise in his 2008 win. A lot of counties that were Republican in 2000, 2004, and 2012 switched for him in '08. Texas seems to contain the only top 10 U.S. cities that tend to go Republican at least as often as Democrat if not more, and the metro areas seem to be very Republican, particularly Dallas-Fort Worth. Interesting in that San Antonio, Austin, DFW, and Houston are seemingly the only very large cities to buck the urban Democrat trend.